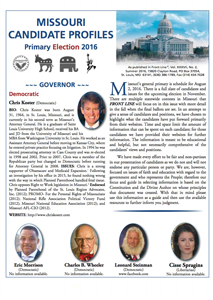 Missouri’s general primary is schedule for August 2, 2016. There is a full slate of candidates and issues for the upcoming election in November. There are multiple statewide contests in Missouri that FRONT LINE will focus on in this issue with more detail in the fall when the final ballots are set. In an attempt to give a sense of candidates and positions, we have chosen to highlight what the candidates have put forward primarily from their websites. Time and space limit the amount of information that can be spent on each candidate; for those candidates we have provided their websites for further information. The information is meant to be educational and helpful, but not necessarily comprehensive of the candidates’ views and positions.